The No. 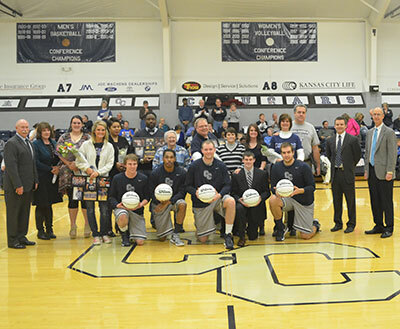 1 ranked Cougar men’s basketball team continued their winning ways with a 67-52 victory over Hannibal-LaGrange (Mo.) University on Thursday night in the quarterfinals of the American Midwest Conference (AMC) postseason tournament. Columbia, the tournament’s top overall seed, improves to 31-0 with the win and is the only remaining undefeated team in all of college basketball for the 2012-13 season. Leading 7-5 early in the contest, the Cougars used an 11-0 run to go up 18-5 at the 12:13 mark of the opening period. Columbia finished the half shooting 48 percent from the field and held the visiting Trojans to just seven field goals. The Cougars also prompted 10 Trojan turnovers and outrebounded HLG 17-15 in the first frame. Columbia never trailed in the second half and went up by as many as 20 before finishing the contest with a 15-point win. The two teams hit an identical 13 field goals apiece in the second frame but the Cougars maintained the edge with tough defensive, forcing a total of 16 turnovers in the game and grabbing four more rebounds than Hannibal-LaGrange. Junior Devin Griffin led all scorers with 20 points, four assists and seven rebounds. Jordan Dressler and Derrick Dilworth each chipped in 10 points. Jurgen Lico led the Trojans with 17 points. Prior to tonight’s game, the AMC recognized members of the 2012-13 Academic All-Conference team. To qualify as a member of the Academic All-Conference squad, a student-athlete must carry a cumulative grade-point average of 3.0 on a 4.0 scale and must have been a member of the program for the entire year. Honorees from Columbia were Ben Bowman, Wendell Crowder, Jordan Dressler, Djordje Mraovic, Hal Payne, Zach Rockers, Chantel Stanciel, Tanner Sutton, Blake Walker and Brock Walker. The Cougars return to the court on Saturday, March 2 to host Williams Baptist College in the tournament semifinals. Tip-off is set for 4:00 p.m. at the Arena of Southwell Complex.